Regular exercise has been linked to a longer life and all kinds of benefits for the body, including the brain. Being physically fit at midlife, for example, is linked to a lower risk of Alzheimer’s disease and other forms of dementia in old age. And studies suggest that ongoing physical activity may delay the onset of Alzheimer’s and may help those who already have the disease. Now scientists are getting a clearer understanding of why. When we exercise, a new study found, our bodies produce a hormone called irisin that appears to help protect the brain against the ravages of Alzheimer’s disease. The study was conducted in mice but, researchers say, may likely apply to people as well. For the study, published in Nature Medicine, scientists studied mice that had been bred to develop a memory-robbing disease similar to Alzheimer’s disease in people. They infused irisin into the brains of the animals, and the animals began to perform better on memory tests. Neurons in the hippocampus, a part of the brain critical for memory, also showed a better ability to communicate with one another. The scientists also gave healthy mice a drug that blocks the production of irisin, then infused their brains with beta-amyloid, a toxic protein that builds up in the brains of those with Alzheimer’s disease, killing off brain cells. Without any irisin in their brains, the mice soon showed signs of failing memory and other symptoms of dementia. Healthy mice that were still able to produce irisin, however, showed only limited damage from beta-amyloid. And when the scientists had the mice exercise by swimming for an hour every day for five weeks, the mice had high levels of irisin in their brains and were much better able to fight off the damaging effects of beta-amyloid. People, like mice, also produce irisin when they exercise. Scientists found that levels of the hormone were especially high in the brains of people who were free of dementia when they died. But irisin was barely detectable in the brains of people who had died with Alzheimer’s. The findings suggest that by boosting levels of irisin, exercise may play a key role in promoting brain health and protecting against dementia. Exercise has other benefits as well, promoting bone and muscle strength and thereby lowering the risk of falls, including among those with Alzheimer’s disease. 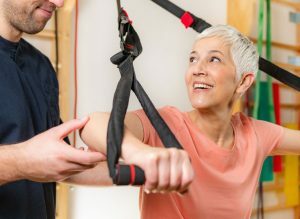 Earlier research has shown, for example, that a home exercise program can provide a cost-effective solution for improving the physical frailty that often arises in those with Alzheimer’s disease. Getting exercise also led to modest improvements in day-to-day activities like getting dressed, walking and eating. Any improvements in these activities can allow people with Alzheimer’s to remain at home longer and delay the need to enter a nursing home. Alzheimer’s is a complex disease that likely depends on many factors, including the genes you inherit. Lifestyle factors are likely just one part of the preventive puzzle. While regular visits to the gym or a home exercise program won’t guarantee a physically and mentally robust old age, it may help you to look, feel and act younger.